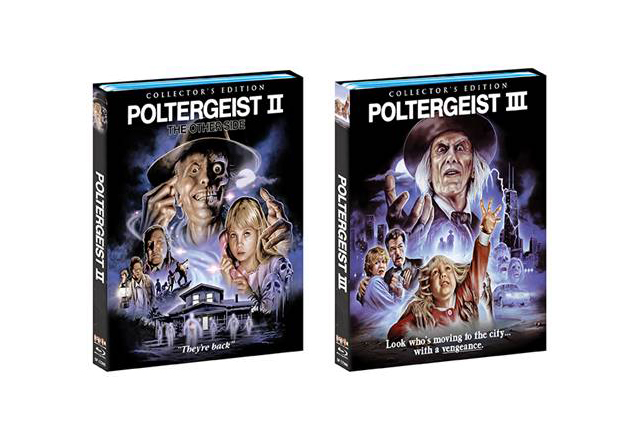 Scream Factory is unleashing the definitive editions of two supernatural horror classics with the release of the Collector’s Editions of Poltergeist II and Poltergeist III on January 31, 2017. The suspenseful saga of Carol Anne and the Freeling family continues in these follow-up films to the smash hit Poltergeist, and are filled with spectacular special effects, memorable scares and a genuinely creepy villain. These scary sequels both include DTS-HD Master Audio 5.1 and DTS-HD Master Audio 2.0 tracks and come loaded with brand-new bonus features, including new 2k scans of the inter-positive, audio commentaries, interviews, behind-the-scenes featurettes and more! In Poltergeist II, the thrilling follow-up to the smash hit Poltergeist, the Freeling family (JoBeth Williams, Craig T. Nelson, Heather O’Rourke, Oliver Robins) settles into a new home following the annihilation of their former residence by terrifying visitors from the netherworld. But the spirits of the dead are still hell-bent on luring the family’s clairvoyant daughter Carol Anne to “the other side.” This chilling sequel, directed by Brian Gibson (Breaking Glass) also stars Will Sampson (One Flew Over the Cuckoo’s Nest), Julian Beck (The Cotton Club) and Zelda Rubinstein (Anguish), returning as Tangina. Fans can pre-order their copies now at this link. In Poltergeist III, they’re back… again! And they’re looking for Carol Ann (Heather O’Rourke) in this riveting finale to the Poltergeist trilogy. Sent by her parents to live in a Chicago high-rise with her aunt (Nancy Allen, Carrie) and uncle (Tom Skerritt, Alien), Carol Ann discovers she must now face demons more frightening than ever before. Led by the Reverend Kane (Nathan Davis, Flowers in The Attic), the spirts have moved from invading homes to taking over an entire skyscraper. They are lurking behind every mirror… waiting. Fortunately, Tangina (Zelda Rubinstein, Poltergeist) returns to help battle these malevolent forces. Fans can pre-order their copies now at this link. · NEW Mirror Images – an interview with Special Effects Creator John Caglione, Jr.